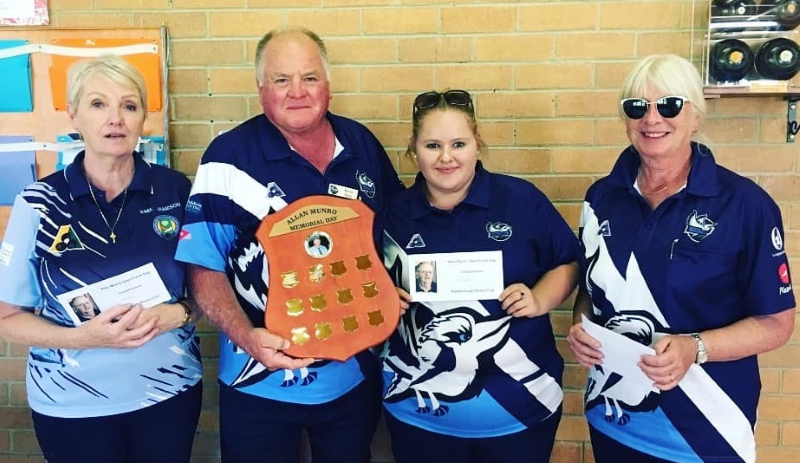 2019 - Keysborough Kookaburras Soar! 6 Finals - 3 Flags! Team 1 enjoyed an outstanding 2018 ~ 2019 season by ending up on top of the ladder, and earning a place in the finals. They met Berwick 3 in the Metro Sectional Semi-finals, beating them (86~63). This was followed by the Metro Sectional Final, played at Burden Park. Whilst Edithvale put up a good fight, we were too strong, winning (93~76). This gave the team an automatic promotion into the Division 1 and the Metro Sectional flag. Congratulations to all those involved - a great effort! Winning the Metro Sectional meant automatic entry into the Metro Divisional Quarter Finals. This was played at Clayton against Middle Park, who proved too strong for us (66~96). Team 2 also had a successful year, and played in the Metro Sectional Semi Finals. Having put in a valiant effort, they were just beaten by Cranbourne 2 (70~74) in the final few ends. Fantastic effort, and congratulations to all those that participated. The club is very proud. Team 3 finished 5th on the ladder. Given that this team were promoted to Division 5 only last year, this season's result is still a truly remarkable. L to R - (Top) - Terry King, Klaus Gunthner, John Sprakel, David Osborne, Fred Henry, Roy Green & Max Cooksley. 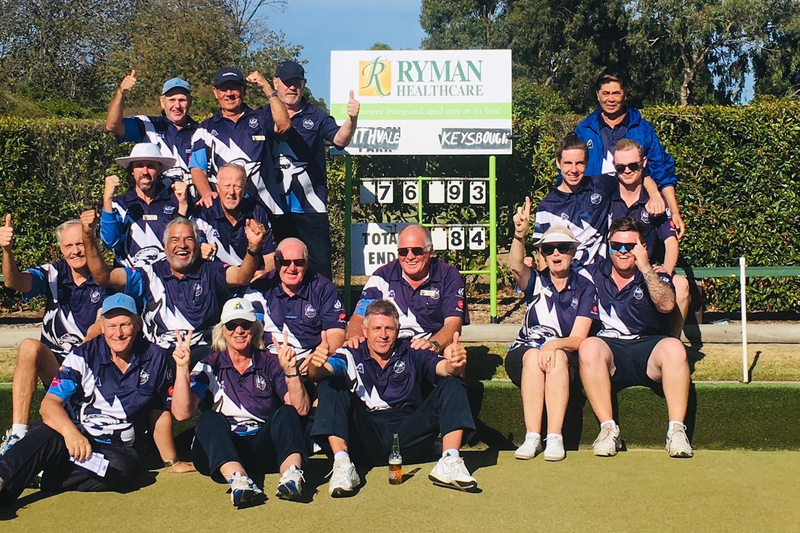 Team 4 put up a remarkable fight by getting into the finals, defeating Burden Park 4 in the Metro Sectional Semi-Finals (83~67) followed by a win in the Metro Sectional Finals at Beaumaris against Noble Park 3 (90~83). This win automatically promoted the Division 7 side into Division 6 together with earning the Metro Sectional flag. Fantastic effort and congratulations to all those who participated. To sum up, the Saturday Pennant teams had 3 out of 4 teams in the finals, with 2 teams winning the Metro Sectionals and associated flags, and being promoted to their respective higher Division. It doesn't get much better than this! Peter Gillette, Cindy Brodie, Sue Jones, Liz Hunter, Michael Gray, Gloria Munro, Brian Gay, Bob Steele & Greg Kelly. This team is yet another Keysborough team that has achieved remarkable results during this season. 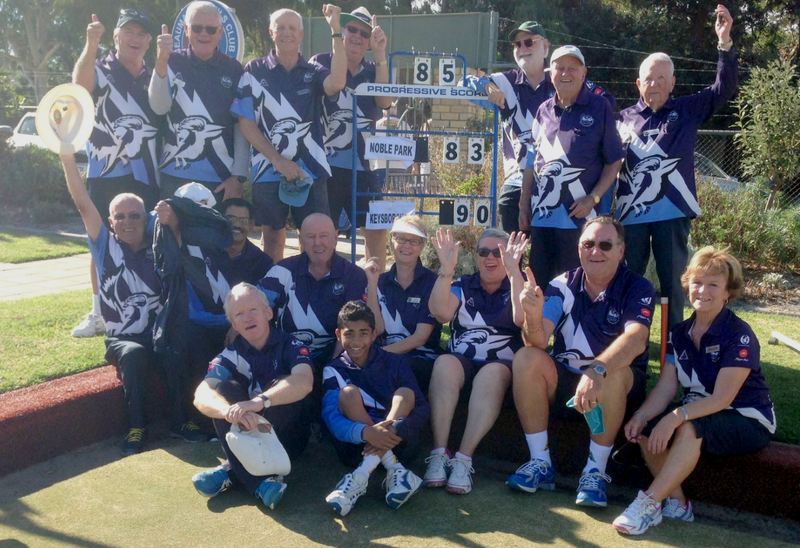 Having secured a place in the finals for 2018/2019, they met with Burden Park 1 at Keysborough to play in the Metro Semi Finals, which they won comfortably (68~38). They then played against Dandenong 1 at Mulgrave Country Club in the Metro Sectional Final. This match turned into a nail-biter, and was won by Keysborough (55~53), securing them the Metro Sectional flag, and promotion into Division 1. 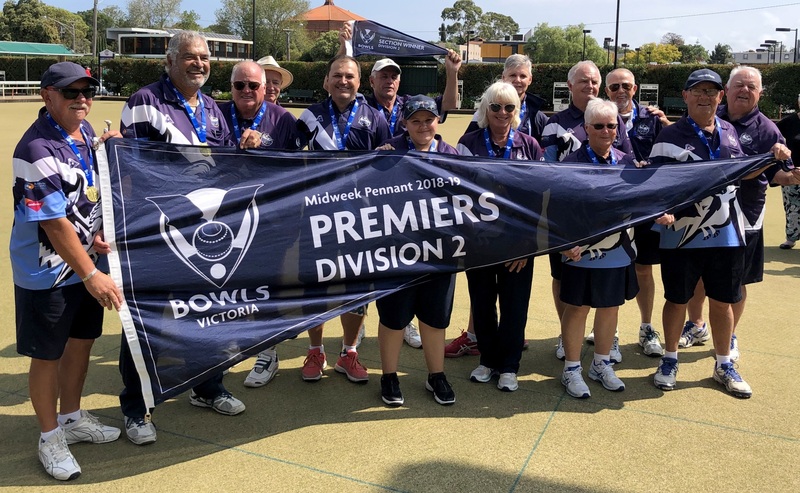 Following the win against Heathmont, the team was presented with an enormous Premier flag (see above) and medals by representatives from Bowls Victoria. This year saw the third Allan Munro Open Fours Day. Originally known as the New Year's Invitational Open Fours, the event has become a popular game for local and visitors alike. Allan Munro was, and always will be "Keysborough Bowls Club". Together with his wife Gloria, they made a formidable team, and both worked tirelessly in the interest of the club. Today, Gloria Munro is still the main driver behind many events, and the club is truly indebted to her and her continuing efforts to organise the many games and especially Corporate Events. New members, bowlers and non-bowlers alike, are always welcome at our club. Anyone that has never picked up a bowl is provided with all the assistance, including the use of club bowls, basic coaching, and companionship, that is needed to make you feel at home. Our club is very friendly,and always ready to help new players settle in. Contact the Club Secretary - Colleen Deer - (H) 8774 0210 (M) 0402 748 940. 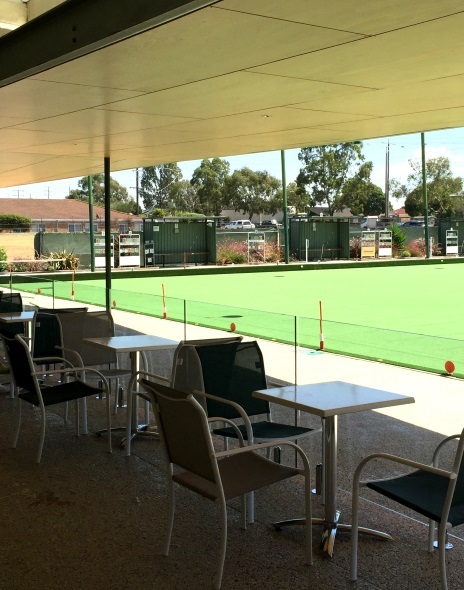 Following completion of the Membership Form, please forward to the Keysborough Bowls Club at 356 Cheltenham Road, Keysborough, 3173, Victoria; or call in to the club - we'd love to meet you! The above organisations are just some of the many, that have enjoyed a great day of barefoot or corporate bowls at Keysborough Bowls Club. Your organisation can also be part of this great experience by making a booking at the club now. We can accomodate day and night barefoot bowling. The day/night will include a bowling experience assisted by club bowlers, food can be catered, finger food can be provided, and a good size BBQ is available for use, or we can cook the food for you. We have a fully licenced bar, and air-conditioned premises for those hot days. Bookings are coming in quickly, don't miss out! 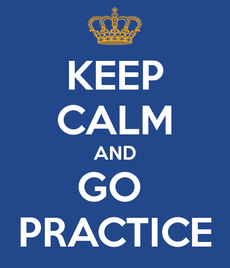 The club welcomes any person interested in having a go at lawn bowling - it really isn't all that hard, and can provide a great deal of fun! From having a go, and liking it (and we think you will), you may consider taking up bowls at a social level, or competitive level. KBC has two synthetic bowling greens, both ideally suited for corporate, or barefoot bowling events. The front green also has lights, allowing for events to be held at night. We are a club for the young at heart and encourage anyone to have a go! We provide a great atmosphere, good facilities, and friendly members, who will always be ready to assist and encourage anyone willing to try. Alternatively, you can fill in this form, and drop it off at the club - remember - we'd love to meet you!